This legal sign marks the top boundary of Crown Grant Property just below Gaithright Dam. In late June I informed MidCurrent readers of a unique lawsuit brought by a landowner with riverside property on the famed trout waters of Virginia’s Jackson River. Known mostly as a haven for brown trout fly anglers and novice paddlers, the Jackson was at the center of the 1996 Kraft v Burr decision, in which the Virginia Supreme Court ruled that landowners on a section of the river stretching from just below the Gathright Dam to Johnson Springs could deny public use of the river because they held a Crown Grant to the property. The Court held that the landowners’ rights under English Common Law obviously preceded the Commonwealth’s own law, enacted in 1800, which conveyed the land under the water to the purview of the state. Today anglers may float through the Crown Grant section of the Jackson River, but they may not touch bottom or fish in the section. 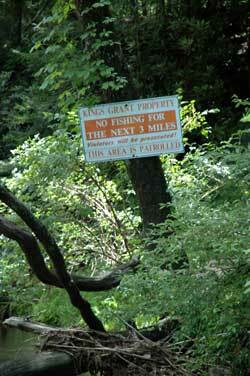 The off-limits area is clearly marked on state maps and maps posted near river access points. And now the Jackson is making news again, and not, unfortunately, for its trout: A Jackson River landowner is suing two anglers for fishing through what the landowner claims is private property, even though the anglers never got out of the river. The current case revolves around a section of the Jackson between Smith Bridge and Indian Draft that has been posted by The River’s Edge, which offers homesites for sale along the river bank. Nevertheless, the Virginia Department of Game and Inland Fisheries recognizes the same section of the river as public—and maps at river access points and on the department’s website are marked to indicate that the section is suitable for fishing and other leisure purposes in accordance with state law. 1) All river beds deemed navigable are the property of the state unless otherwise conveyed. 2) The 1996 court case of Kraft v Burr did not apply to the section of the river he had posted. 3) While members of The River’s Edge may have special limitations imposed on them while they were fishing the river, these limitations could not be imposed on the public. 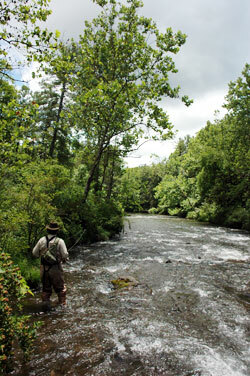 The Jackson River in Virginia is reputed to be the best wild brown trout fishery in Virginia. The letter also seems to imply that the signs might be construed as inhibiting the public’s right to fish on public waterways, which is against state law. At this point the savvy reader might ask: Of course anglers have the freedom to fish in public waters, but don’t landowners with riverfront property have rights, too? The answer is, that depends. For example, in Virginia, the answer to that question depends on property lines and the navigability of the waterway. (In other jurisdictions, the answer may depend on other considerations.) What is beyond doubt, however, is that anglers may not trespass to gain access to the river and may not step up on the banks of private property for anything other than emergencies like the righting of one’s canoe after a spill. North/South Development v Frank Garden does warrant closer scrutiny because its outcome affects all Jackson River sportsmen. When Mr. Sponaugle asked the anglers to leave the section of the Jackson River that he had posted as private, they protested that they all had valid licenses and were fishing in an area designated as public on their maps. The plaintiff called the sheriff’s office, but officers wouldn’t cite the anglers because they were fishing outside of the recognized Kraft v Burr section of the river. Eventually the anglers left the disputed section of the river, and at some point thereafter, the plaintiff decided to press civil charges against the anglers in the amount of $10,000 each. Property owners who wish to apply for a variance must do so with the Virginia Marine Resources Commission (VMRC) because the VMRC has jurisdiction over all the Commonwealth’s submerged waterways. And yet when asked about a variance for the River’s Edge property on the Jackson River, John Bull, the direction of public relations for the VMRC, who insists that the commission would be the “first stop in ascertaining the validity of a King’s Grant claim,” also stated that the commission had not received any documents from anyone attempting to establish such a claim over the disputed property. When the story broke that these hapless anglers were being sued for trespassing on what the VDGIF contends is public property, anglers reached for their phones to complain to the VDGIF directly. When I called about the case, VDGIF officials referred me to the Virginia Attorney General’s Office, where the director of communications told me that the Commonwealth generally doesn’t intervene in disputes between private parties in civil trespassing cases like this. He continued that the “legal presumption” is that waterways and bottomland are public unless proven otherwise and that the Attorney General needn’t be involved for the court to determine ownership of the Jackson riverbed. Virginia is certainly not the only state in which sportsmen and property owners are facing off: A similar dispute is brewing along the banks of the South Holston River in Tennessee. Knox Campbell, director of the South Holston Fly Fishing Festival, hopes to educate anglers about some of these issues at the upcoming event: “I think anglers need to know their rights and also respect property owners as well.” Campbell will also be soliciting funds at the event for the defendants in North/South Development v Frank Garden in Virginia.